One thing we love the most about those fabulous young actors and actresses from Netflix’s Stranger Things is how honestly they are living their lives. They’re fans of things, they’re nerds, they have social media accounts that reflect this, and they too like doing Halloween things. 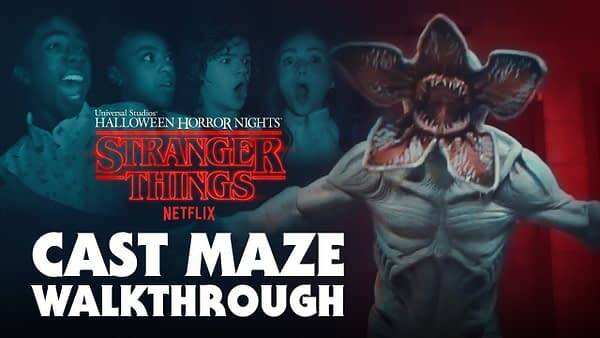 Specifically, to kick off the Halloween Horror Nights event at Universal Studios Hollywood, Gaten Matarazzo (Dustin Henderson), Caleb McLaughlin (Lucas Sinclair), Sadie Sink (Max Mayfield) and Priah Ferguson (Erica Sinclair) walked through the Stranger Things season 1-themed walkthrough maze, complete with Demigorgons and more. Halloween Horror Nights continues on select nights through November 3rd in Hollywood and Orlando, and on select nights through October 31st in Singapore. Stranger Things seasons 1 and 2 are available on Netflix now, with season 3 expected sometime in 2019. David Harbour Says Hellboy is a "Classically Complicated Hero"
David Harbour Believes 'Stranger Things' Chief Hopper is "Very Good Dude"